One of my hubby's favorite dishes is chicken pot pies! I wanted to try something new to make a healthier version of the pot pie. This was a huge success. The kids loved helping with this and eating as well. It was so easy to make as well. Since I don't eat chicken, I did a vegetarian version for myself and did mushrooms instead of chicken. I recommend doing a mixture of mushrooms. I used baby Bella and shitake mushrooms. 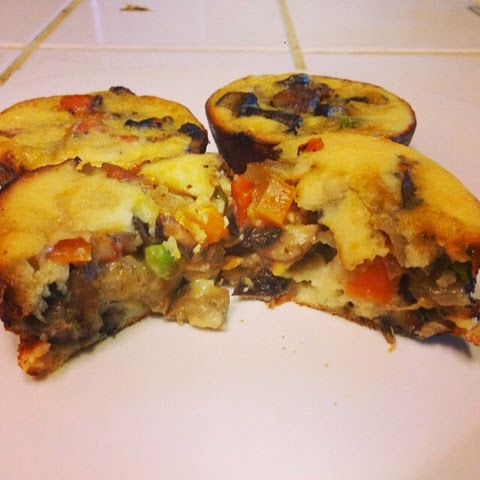 These little pot pies were so good, I may need to add this to our shopping list every week!! In medium bowl, stir baking mixture ingredients with whisk or fork until blended. Spoon 1 scant tablespoon baking mixture into each muffin cup. Top with about 1/4 cup chicken mixture. 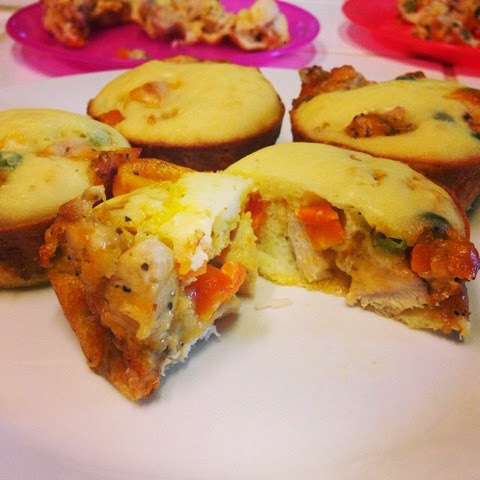 Spoon 1 tablespoon baking mixture onto chicken mixture in each muffin cup.